We do accept used book donations, but because our space is limited we have to be selective about additions to our book collection. The library focuses on small press, art books and radical subcultures, and is built from suggestions made through our member-curated Request List. Any books donated from this list will be immediately added. Donated books that are not added to our collection will either be sold or recirculated into the community. If you would like to donate books, we accept donations from 2pm to 6pm. Small press publishers producing literature, art books or poetry are encouraged to donate publications to us! We love featuring indie works, and we would happily host touring authors. For the most part, we don’t want your old stuff… don’t bring it here. 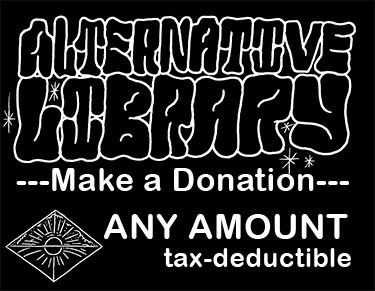 We are a 501c3 non-profit corporation and as such all donations made to the AltLib are tax-deductible. Please donate to support radical creative culture!